H&L worked closely with Sidmouth Town Council and a range of partners including the Jurassic Coast Team, Dorset AONB and South West Coast Path teams to project manage a vibrant new visitor centre on the seafront. The project, delivered from initial designs to opening in seven months, was co-ordinated by Martin Cooke. 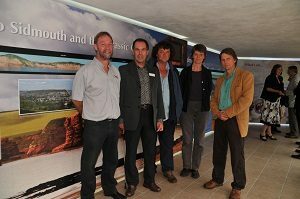 In addition Martin worked closely with, Lam-Art Exhibition and Design, Richard Edmonds – Jurassic Coast Earth Science Manager and graphic designer Giles Sadler of Thorntree Design on the 3D and graphical style of the new Centre. Contributors to the project included wood designer/maker Karen Hansen and professional photographer Ben Osborne. An opening of the Centre in July 2011 was well supported by Town councillors, project partners and stakeholders. “The Town Council were introduced to Heritage & Leisure by the Jurassic Coast team and Sidmouth Town Council took the relatively unprecedented decision to appoint outside the County of Devon. This decision was never regretted. Martin Cooke undertook his role in both a professional and efficient manner. His management style is courteous, helpful and friendly, putting everyone at their ease and engendering a real feeling of a ‘team’ working together towards the end product. I have enjoyed working alongside Martin over the past months and intend to recommend his company to anyone wanting a similar service”.